This? This is an exercise in patience for me. 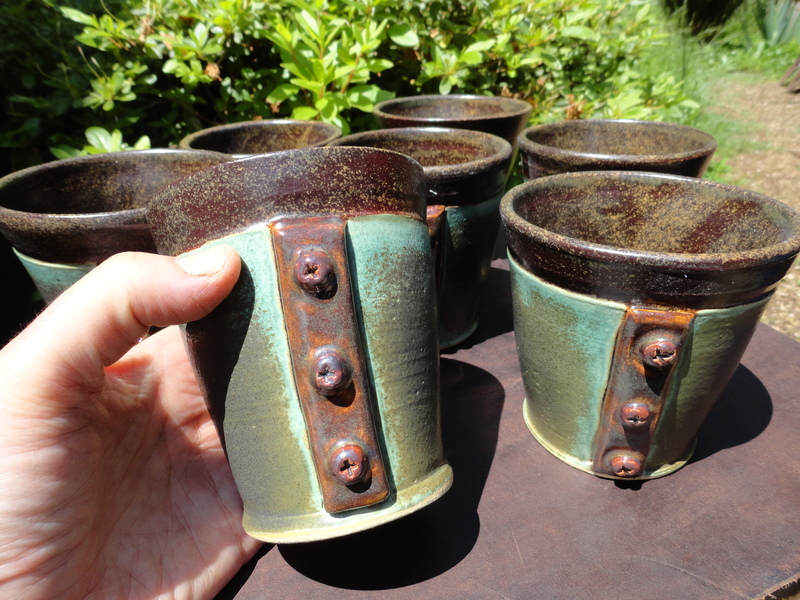 I have an pervasive fascination with historical pottery. 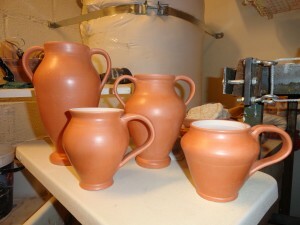 In particular, I absolutely adore the classic Greek vessels primarily used for wine. As an artist and a potter I am inspired and one might say almost driven to want to ~make that thing~ so I can hold it in my own hands instead of just peering at lovely pieces through the glass of museum cases. I’ve been working on throwing vessels which are inspired by the shape of classical pieces for a while but until now I’ve only been lightly dipping my toes into the water of surface decoration. 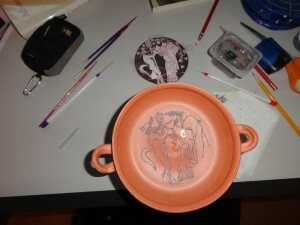 Now I’ve decided to work on an entire new line of pottery inspired by historical pieces. Have I mentioned how incompetent I feel when confronted with the need to do two dimensional art? Drawing and painting? Not my forte. I know myself well enough to realize that unless I’m put in a position where I ~HAVE~ to learn, I’ll keep avoiding using the skill that I feel I’m not very good at. 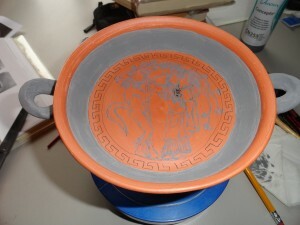 So I made a bunch of vessels with the intent of decorating all of them with classic Greek designs. A few of the new Greek inspired pieces. 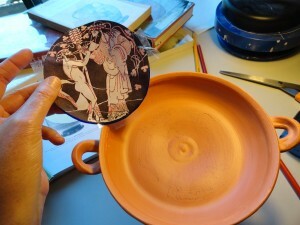 I decided to work on a Kylix as the first piece. My current process is to look for a design online and print it out in the appropriate size then using transfer paper I trace the outlines of the design onto the surface of the vessel which has been previously coated with terra sigillata and bisque fired. 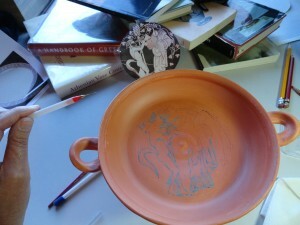 Then I EVER SO SLOWLY WITH THE TINIEST PAINTBRUSH EVER start to fill in the design with a black glaze. I have to periodically walk away and take a break. If I don’t make myself step away every once in a while I find that I’m trying to rush through the work just to get it finished and my painting work becomes more and more sloppy. Here’s what this piece looks like right at this moment. I’ve already realized that there is no way I could ever charge appropriately for the amount of time I’m going to put into each piece but that’s okay. Working on them is a labor of love. 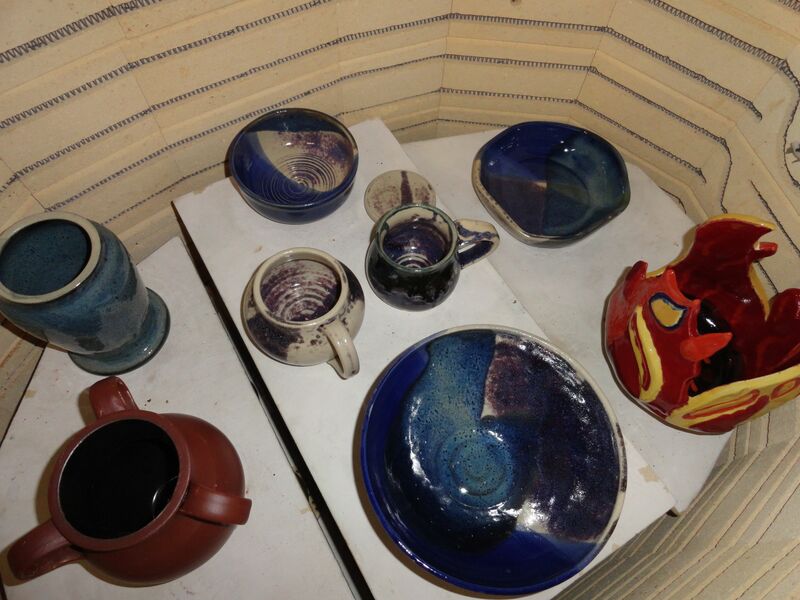 I’ve got 3 Amphorae and 5 Amphorae inspired mugs sitting downstairs still waiting for glaze work. 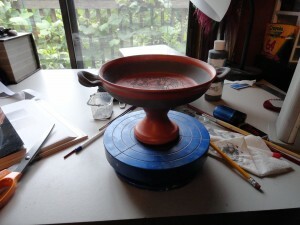 After this first test run is done I think I might expand into other shapes and maybe even try some Mycenaean inspired pottery. Somehow I don’t think I’m going to run out of work to be inspired obsessed by any time soon. This one time.. when I was wrong. Those are beyond beautiful, as always, hon. You are amazing; and your brushwork has leaped forward in amazing ways. 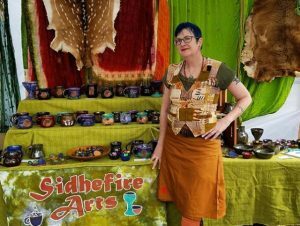 I am so very much looking forward to seeing the results of this ‘obsession’…which, I must say for those of us who hope to purchase and enjoy these artworks for years and rituals to come, I hope continues for a very significant stretch of your creative life. Because…GORGEOUS!! !